Local Celebrities Give Away Turkeys at Unity Plaza Community Center - Grand St. Settlement | Bold. Grand. Inspired. 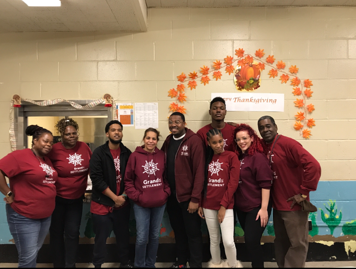 Celebrities such as former New York Giant Deon Grant and musician Lil’ Mama helped distribute free turkeys for the Thanksgiving holiday at our Unity Plaza Community Center in Brooklyn. Grand St. Settlement partnered with The Grant Foundation, NorthStar Charities, Man Up!, and Meda Leacock to give away over 300 turkeys to the Brownsville and East New York communities. For more information, check out The Source‘s coverage of the event.